Neil Perkin recently ran a Wordle to analyse Obama's speech to the Democrat convention. 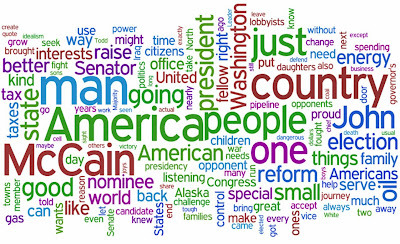 I thought it would be interesting to follow this up and use Wordle to identify and compare the key themes from the Vice President convention speeches of Sarah Palin and Joe Biden - and have noticed something interesting about Sarah Palin's convention speech. Sarah Palin focusses on 'America', 'people' and 'country'. She also talks at length about 'John McCain' and seems to use the word 'man' regularly. The really interesting thing is that she doesn't ever mention the words 'Barack Obama', she hints at who she is talking about and regularly mentions 'opponents' but doesn't mention Obama at all - in a 36 minute election speech this has to be by design rather than by accident. Joe Biden by contrast talks a lot about 'Barack Obama' (unsurprisingly), but also references 'John McCain' regularly. Joe Biden also pushes 'people' and 'American' as well as 'time' and 'change', but his speech does not include the word 'country' nearly as much as Sarah Palin's speech. So Wordle analysis seems to imply that both parties think that they will win votes by talking about John McCain regularly, whilst the Republicans seem to be avoiding the words 'Barack Obama' implying that the threat to them comes from the Obama brand rather than the Obama blueprint. Interesting to see if John McCain mentions Barack Obama by name or if he continues the theme of just referring to Obama as his 'opponent'? Related post: New Facebook Lexicon allows analysis of use of words and the context around them on Facebook. New Facebook Lexicon analysis of the term 'Palin' on Facebook is here. I did it for all 4 speeches. Check it. And it might be worth noting this new blog exclusively dedicating to this sort of thing: Political Tag Clouds.